Rush orders (within 4 hours) with charge of SGD 300. To order dedicated servers or VPS (virtual private servers), please contact us using the contact form. Mar 2014: Added 5 units of Dell R720. Dual Xeon E5-2690v2. May 2012: Ordered 5 units of Dell R720 with E5-2690 (8C, 16T) CPUs. May 2012: Ordered 10 units of Dell R210-II with Ivy Bridge CPUs. Dec 2011: Ordered 20 units of Dell R210-II. Sep 2011: Ordered another 10 pcs of Dell R710. 14 Jun 2011: Received Dell Poweredge R710 servers with X5690 3.46GHz Westmere-EP 6C, 12T CPUs. 9 Mar 2011: Ordered additional 10 servers, Dell R710, Intel Xeon X5670 (Hexa or 6 Core). Storage are 600GB 15K SAS Hdds. 8 Mar 2011: Ordered 5 servers, with Xeon E5620, 600GB 15K SAS Hdds. 20 Dec 2010: Received 8 servers, Intel Xeon, e5620, x5650. 25 Feb 2010: Received 8 pcs of Intel X25-M 160GB Solid State Drives (SSDs). 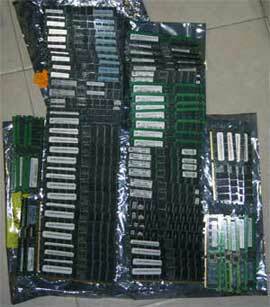 23 Feb 2010: Received 5 pieces of Intel X25-E 64GB SSDs, 28 pieces of Opteron 8356 CPUs. 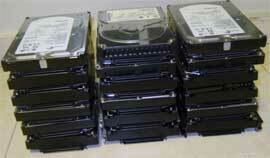 9 Jun 09: Received 10 pcs of 15K 300GB SCSI Hdds. 1 pc APC rackmount air distribution. 30 Apr 09: Received LSI RAID cards, 3 pcs APC rackmount air distribution, 2 pcs Dell powerconnect 6248. 7 Apr 09: Received 5 pcs of APC switched 8 port PDUs (for remote reboot), 100 pcs of 2GB ECC RAM modules for server upgrades, RAM drive. 20 Mar 09: Received 1 x APC ACF002 rackmount fan. 27 Feb 09: Received 10 pcs 15K 300GB SCSI HDDs. 27 Jan 09: Received SCSI RAID cards. 29 Dec 08: Received 7 quad socket servers, 32GB RAM ECC per server. 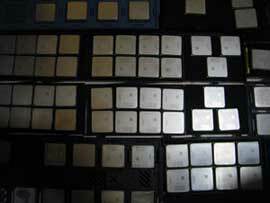 19 Nov 08: Received 10 pcs 15K 300GB SCSI HDDs. 18 Nov 08: Received 6 pcs of Quad socket servers; additional 7 quad socket servers ordered for dedicated server upgrades. Nov 08: Retired ~20 pcs of 1U single core dual socket servers. 9 Oct 08: Received qty 1 of 4U Quad socket server. Sep 08: Received ~100 pcs of 73GB and 300GB 15K RPM SCSI HDDs, and ~192GB ECC RAM for dedicated server upgrades and provisioning. 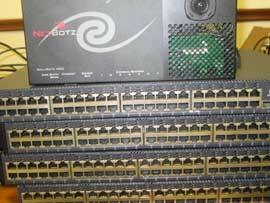 Aug 08: Received 10 pcs of 1U dual socket servers. 17 Jul 08: Additional ECC RAM modules, KVM over IP cables, several 1U dual socket servers. 24 Jun 08: Received APC air distribution, console switch for out of band access, 300GB 15K SCSI HDDs. 30 May 08: Up to this date, received KVM over IP switch and 10 additional KVM over IP cables, 300GB 15K RPM SCSI HDDs. 09 May 08: For this week, received 3 pcs of Dell powerconnect gigabit switches. 24 Mar 08: Received 20 servers. Dec 07 to Mar 08: Received CPUs, RAM, HDDs, servers. 28 Nov 07: Servers arrived. Stock status changed to green. 21 Nov 07: Stock status changed to Orange (Amber). Running out of servers. We have ordered additional 10 new servers, ETA 1 week. 17 Nov 07: Received Dell storage boxes, APC air distribution units, IBM 1U opteron servers, additional GE network cards, SCSI RAID cards. 01 Nov 07: Received Dell Powervault storage boxes, Dell remote KVM over IP. APC Smart UPS 3000, IBM 1U opteron servers, additional RAM and harddisks. 18 Oct 07: New equipment received: Firewalls; Juniper Netscreen, 4GB RAM Modules, IBM 1U servers, Extreme Summit network switches, 300GB SCSI Harddisks, Fibre cables and transceivers, APC AP7920 Remote reboot switches. 27 Sep 07: New equipment received this week: APC ACF002 Air Distribution units, 300GB SCSI Hdds, IBM 1U opteron servers Dual Socket Dual core). 04 Sep 07: New stock received this week includes Netenforcer, Juniper ISG1000, Octa (8) x Opteron dual-core servers (total 16 CPU cores per server), Dragon Enterasys IDS (Intrusion Detection). New stock arrived. Status changed to Green. Quad dual-core opteron servers now available. Servers close to sold out. Status change to red. New shipment received. Stock status remain at orange (amber). We are still selling faster than we can provision servers. Servers arrived. Keeping stock status at orange (amber), as we are still low on availability even with the additional servers. We are able to provide dual socket, dual core opterons currently. Testing out quad socket, dual core opteron servers; may use as VPS server if this works out. Stock low. Have put in order with supplier, and expect shipment of new servers in around 3 weeks. VPS is fully booked. Dedicated servers are fully booked. New dedicated servers expected in 1 week (being shipped from USA). VPS availability is estimated at 2 weeks. No longer accepting orders for colocation. Priority goes to dedicated servers.